First To Line Up at The Buffet - Will Casino Have Walmart-type Effect on Elk Grove's Chain Restaurants? During the scant public hearings held last year on the proposed Wilton Rancheria's casino resort, then Elk Grove City Council Member and current Mayor Steve Ly unwittingly uttered a now famous, and perhaps prophetic line. When discussing the tribe's proposal and his obvious excitement for the casino, and its obligatory all-you-can-eat smorgasbord, Ly giddily said when the $400 million facility opens, "I'll be first to line up for the buffet!" Whether Ly knew it or not, his schoolboy-type excitement at the prospect of gorging on endless plates of mac and cheese, slices of warmed-over cardboard pizza followed by a river's flow of soft serve ice cream pointed to one of the possible ill-effects of the casino. The reference was not to the food per se, rather the effects it could have on other restaurants in Elk Grove. Anyone who has been into a large gaming facility knows operators provide a slew of eating establishments. Aside from the multi-ethnic food themed buffet, casinos will typically have a coffee shop-type 24-hour restaurant, perhaps a high-end place like a steakhouse, snack bars, and possibly an Asian themed eatery. If the still unnamed Wilton Rancheria seeks market share, we only need to look at nearby Thunder Valley casino to get an idea of what to expect. That establishment has the obligatory buffet, High Steaks Steakhouse, the 24-hour Thunder Cafe, the Red Lantern Asian-themed restaurant, and a five outlet food court. The best example might be to look at the effects Walmart has on small independently-owned businesses, particularly in smaller markets. As is well known, when Walmart enters a new market, because of their economies of scale, it quickly kills smaller businesses. When the Wilton Rancheria opens, what group of businesses will be most vulnerable to this Walmart effect? In our view, those businesses most likely to feel the weight will be the national chain restaurants that populate Elk Grove. First, as a group, mid-range casual restaurant chains like Applebee's, Chili's, IHOP, and Sizzler are facing immense pressure. Much of this pressure is coming from other national chains such as Panera Bread in the so-called fast casual restaurant segment. In the last week, Applebee's and IHOP announced that they would respectively close 135 and 160 stores. While it is not known if Elk Grove units would be among the casualties, these chains are nonetheless under pressure. Another victim, of sorts, from the pressure of the fast casual, is Chili's. To reduce cost and improve operations, the Dallas-based chain announced this week that it would eliminate 40-percent of its menu. Elk Grove has, among other national casual chain restaurants, Applebee's, BJ's Brewhouse, Chili's, IHOP, Logan's (which went Chapter 11), Outback Steakhouse, Red Robin, and Romano's Macaroni Grill. Once the Wilton Rancheria opens their gambling parlor, you can bet they will have an offering of restaurants similar to Thunder Valley. Expect to see Mayor Ly's buffet, a steakhouse, an Asian-themed bistro, a 24-hour coffee shop, a food court (which would be detrimental to the Outlet Collection at Elk Grove's proposed food court), and if they are good operators, a sports-themed bar and restaurant. Given the financial heft and expertise of Boyd Gaming, the casino will undoubtedly have a precise marketing and advertising program to lure diners with loyalty cards and discounted dining options. Of course, the Wilton Rancheria is not in the dining business - but they will use the lure of dining to pick the wallets of these same diners at any of its 2,500 slot machines and scores of gaming tables. There is one other aspect that Wilton Rancheria could have on national casual dining chains, and more importantly locally-based high-end restaurateurs, considering opening shop in Elk Grove in the next few years. Even though the casino is not likely to open for at least four years, it will create a wet blanket of uncertainty thwarting investments, especially for relatively small capitalized locally-based operators much less the besieged national chains. Of course, the City of Elk Grove could offer incentives in hopes of attracting some of Sacramento's burgeoning gourmet farm-to fork restaurants, but that is an entirely different subject. Much like the effect Walmart historically had on mom and pop businesses when entering small, non-urban markets, once Boyd Gaming and the Wilton Rancheria fire up their marketing machine, any one of Elk Grove's casual chain restaurants could be the first business fatalities. Golden Corral is constantly packed; does not seem to affect lines and waiting at local restaurants. Hometown Buffet not only did not negatively affect local restaurants, they closed (not sure why) There are plenty of restaurants flourishing around Jackson and Thunder Valley Hotel Casinos. 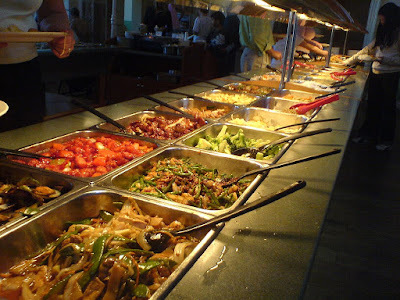 People don't particularly like standing in long lines at the buffets and they are not exactly inexpensive so they go to other nearby restaurants. The additional numbers of people coming to our community will be bringing vast amounts of new business to our local owners. You may find negative effects to local hotel casinos but you would have to dig and or make something up. There are virtually no negatives to the community and lots of positives. GET OVER IT. They were here first and they deserve to have a Hotel Casino. There's one, possibly two flaws in EGN's hypothesis: (1) cigarette smoke, and (2) the majority of the foodies would have to travel from Laguna to the "poor side of town" along Highway 99! How many of them even know we have an Old Town, let alone ever seen it? Here’s what bothers me about all the hype about the casino. The Elk Grove City Council keeps talking about all the jobs as if this casino is going to rev Elk Grove with respect to their continued promises of bringing 20,000 jobs to Elk Grove. Casinos don’t revive cities. And so I ask: If you ever go to a local casino, say Red Hawk, do you venture out and shop at other local businesses? Of course, you don’t. You go directly to the casino, eat their food and drink their free drinks. People who visit casinos do not wander out to visit other local shops and businesses. Why go to BJ’s and spend $30 dollars on liquor when one can go to the casino, get your booze for free and check out the game on their wide screen televisions? Casinos are designed to be all-absorbing environments and it is proven that local businesses nearby suffer. But time will tell who is right and who is wrong. But by then, the entire Elk Grove City Council will have turned over, and like all the fiascos that have occurred in the past in Elk Grove, those leaders, like the current leaders, will blame all of the problems on the previous council and their lack of vision. Here in Lincoln where Thunder Valley Casino is located, it is business as usual at our local restaurants. We even now have a brand new In-N-Out. I have lived in Lincoln for six years, I have been to their buffet twice. Wednesday is senior day so the buffet is packed with Del Webb people so I don't go. I have seen absolutely no impact on local eateries. We still have to wait for a seat at Old Town Pizza in town whatever day we go. And there is a Pizza Hut at the Food Court at Thunder too. I'm sure the RedHawk people will say the same. I think if the Council were being honest with themselves and us, they would be the first to admit that (a) the linkage of the casino to the Outlet Mall is a fallacy, but cooked up as a scare tactic to quell public opposition; (b) the building industry and construction unions have led the charge because they will exert their influence on labor contracts to construct the buildings, count those as "jobs", then move on like locusts once construction is complete; and (c) the whole Council preoccupation with jobs is because it helps justify expansion, which again is being pushed by the locusts. The Elk Grove City Council, for the last several years, has been promising with the development of the SEPA, THEY will bring 20,000 jobs to Elk Grove. I am sure they will reduce that amount by the number of jobs the casino brings in and take full credit for doing so. There is your "untrumped" clarification! My challenge still stands although the battle is over. Bring forth all verified documentation garnered by truly independent researchers to validate the opposition to the casino and and have it published. Not TV ads of Las Vegas or some un-named 2 lane road that has an issue of some sort. Both area casino have publically stated the crime rate actually went down. As stated by a legislator with a long career in law enforcement he also found the crime rate lowered. I find it rather curious that Chairman Hitchcock found this story so objectionable that he felt compelled to provide a strongly worded writtend response. Yet he was silent about the story posted here about a week ago about having a truck stop at the casino. ....A truck stop on 99?? Never heard of it... What a concept !!!! !